My original plan for Episode #62 was to go to Shinobi in Maple Ridge to celebrate the beginning of reading break, but the evil forces of public transportation prevailed and decided to make me miss each of my transfers by a few seconds. 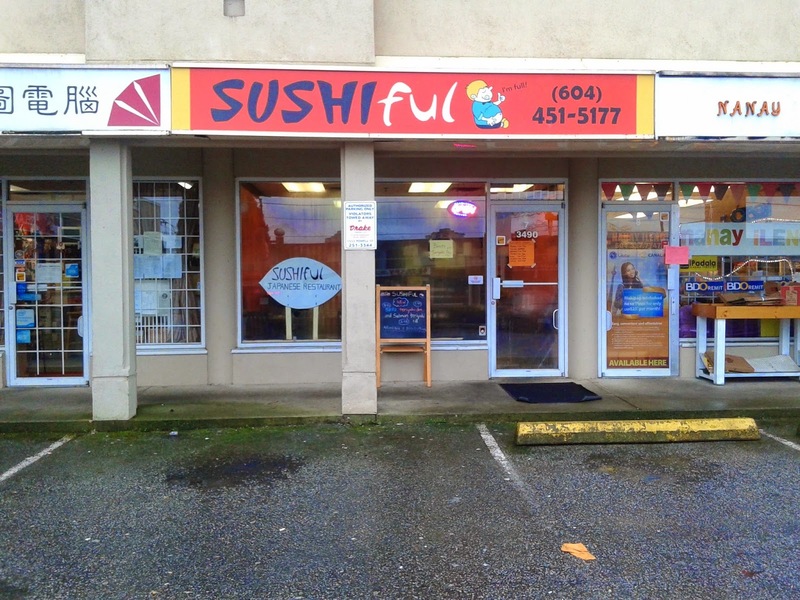 I came up with a back-up plan in a jiffy and headed over to the Korean-run Sushiful, a place that has received numerous rave reviews online. It was hard to resist. Who doesn't want to try a place that prepares exciting special rolls in the $5 to $8 price range? Inside the restaurant, there's a wall that's dedicated to their motto: Don't Stop Till Sushiful. It was good to see that their motto was perfectly aligned with my personal beliefs. The decor was quite basic and resembled a take-out place with tables and chairs more than a restaurant, but the warm welcome I received from the hardworking server and the sushi chef cast my initial doubts aside. I was determined to eat until I was "Sushiful." The first item to arrive was the Dynaska Roll ($5.95), which consisted of tempura prawn, cucumber, avocado, masago, Japanese salad dressing and salmon. It was neatly presented and cut into evenly sized pieces. Unfortunately, the tempura was really soggy and the prawn was devoid of moisture. I also felt that the flavour of the dressing was rather discordant with the prawn. I later reviewed the menu again and noticed that they did not serve any tempura dishes, so perhaps they had to use pre-made battered prawns. 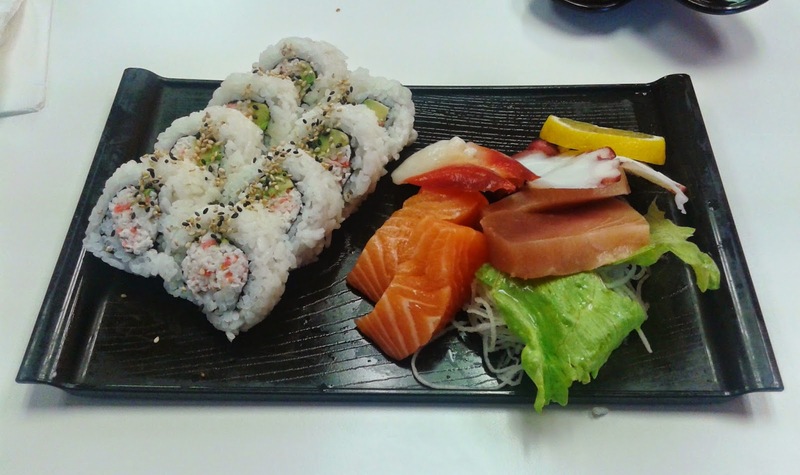 Next, I received the Sashimi & Roll Combo, which contained a California roll and 8 pieces of sashimi (4 kinds). I found it interesting how the roll and the sashimi were facing opposite sides, so I had to turn the dish around to take proper photos of each. The Tuna Sashimi was lacking that melt-in-your-mouth feel of high-grade tuna. The Salmon Sashimi tasted the freshest of the bunch, and came in a thick, generous cut. 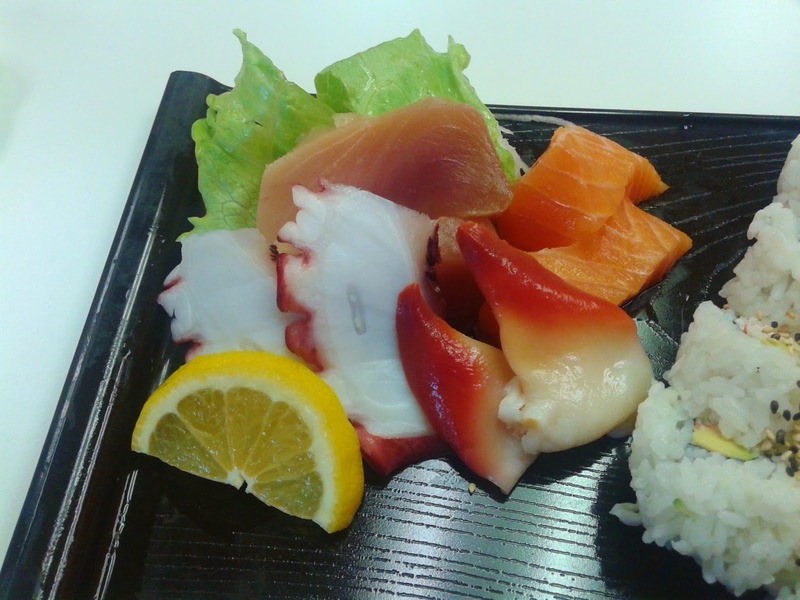 The Tako Sashimi had an unnatural salty flavour, but I enjoyed how it was cut thin so that it would not be too chewy. The Hokkigai Sashimi was a bit disappointing because it had about as much taste as plain water. 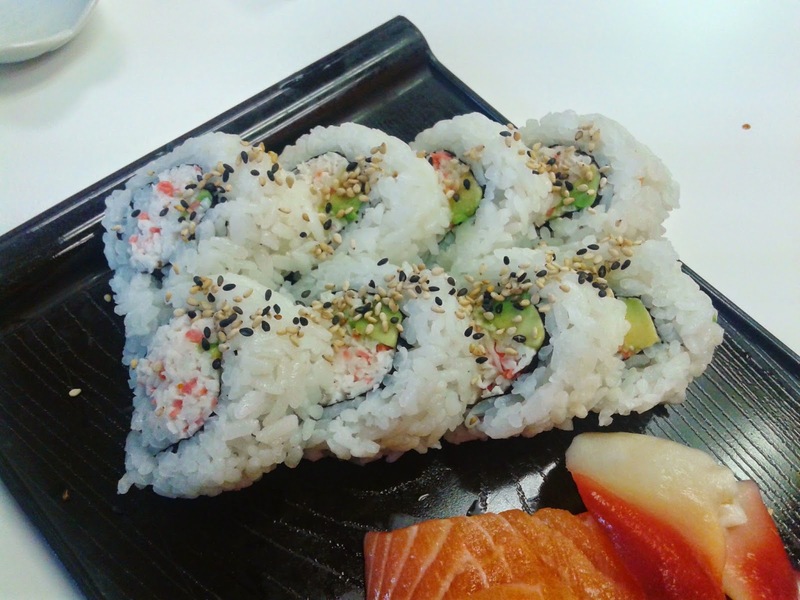 The California Roll was decorated with sesame seeds and covered in a moderately thick layer of rice. The roll was quite mediocre in my opinion and had me thinking about supermarket sushi. On the plus side, there was no freezer burn issue here. Not quite sushiful, and still hopeful that they would deliver superb before I headed out the exit, I ordered a few pieces of nigiri. The Unagi Nigiri (BBQ Eel), at $1.60, is the cheapest in town and had a sweet cookie-like taste. The sauce on top was too strong and left me wondering if they ran out of unagi sauce and used a dab of oyster sauce as a desparate substitute. The Saba Nigiri (salted mackerel) had a salt overdose and the rice under the Tai Nigiri (red snapper) needed more flavour, though the tai itself was not tough and had some flavour to it. The Toro Nigiri was the best part of the meal, and had a smooth fatty texture along with some refreshing sweetness. Despite the low prices, the portion sizes of the nigiri were quite decent. I found the service quite friendly and it was nice to see both the server and the sushi chef trying to make my visit as pleasant as possible. Unfortunately, the prices reflected the quality of the food much more than I had hoped for during my visit. Well, there is always a plus side - I did leave sushiful and my wallet was more than delighted.